Have you heard the audio clip of Felecia Sanders speaking from Chief Magistrate James Gosnell’s courtroom to Dylann Roof? She survived Roof’s brutal attack on her bible study group in Charleston, South Carolina, but her son died there at Roof’s hand. And she offered Roof forgiveness. She was not the only one to do so. Anthony Thompson, Alana Simmons, Nadine Collier, Bethane Middleton-Brown and others who lost loved ones in that hate and fear driven murder at Emanuel African Methodist Episcopal Church have publically done the same. On my way home from work, recently, I stumbled upon the audio clips of the loved ones of the victims speaking directly to Roof in court. Find the clip. And listen. It’s an astonishing spiritual lesson about forgiveness. These amazing people speak with poetic articulation through their heart wrenching pain. They sob as they give voice to their broken hearts, to the depth of their loss, to the life altering repercussions of this hateful act. And then, in the same sentence and the same breath as the pain, they say things like, “I forgive you,” “Have mercy on your soul,” and “We have no room for hating.” Breath taking words. Today I am out for a healing hike, above the vibration of the human fog, and I’m thinking about forgiveness. When I heard that audio clip, alone in my car, I immediately said out loud to no one, “I don’t forgive him!” Hmmm. A moment to pause. How can they forgive him, from the depths of despair, and my knee jerk reaction from afar is to condemn? But what about when it’s your heart that’s broken? Obviously, Ms. Sanders, Ms. Collier and the others who spoke to Roof in court do not mean “I forgive and forget.” Their forgiveness comes from a much deeper, richer place that resides in the Soul. Their forgiveness comes from a place of enlightened faith in the spirit within the human being. I think I should say that last part again: enlightened faith in the spirit within the human being. Here’s what I mean. When we truly know our own spiritual nature, that we are made from and of Love, then we can know this of each other, too. And when we truly know this, then we can “forgive” human error, because we can see through it to the spirit within. Yet, because I’m a human being, it still seems unfathomable to be able to forgive the man who murdered your family. Maybe that’s true for you, too, human reader. So let’s try to make the concept more approachable. Think of your own human errors that you struggle to forgive yourself for every single day – being unproductive, being impatient with your kids, being irritable with your partner, being disorganized, compulsive, impulsive, inattentive, insecure, judgmental…insert anything for which you judge yourself or others. These errors are our humanity. To operate from our spiritual selves means to love ourselves in our human form, not to shame ourselves for our humanity. After all, that which we resist persists. If we judge ourselves or each other for our humanity, it persists, meaning we cannot rise to our spiritual nature. Imagine what it might feel like to truly forgive yourself for your daily humanity. To step into the vibration of your soul and see the struggle of being a person and say to yourself, “I see that you are good and you are Love and you are a human being learning lessons, and I forgive you.” Really, close your eyes for just a second and imagine, with every cell in your body, what it would feel like to hear your soul forgive yourself and your neighbor for being human, every single day. What angsty voices would fall silent in your head? What stores of energy would be liberated? What would you do next?? It’s the Soul, the part of you that knows your spiritual nature, that has such a gift to offer. This is the experience at the core of compassionate authenticity. When we know that in our deepest and truest self we are Love, then we have compassion for everyone and for ourselves, and it becomes clear that sharing our Selves as we truly are is the greatest act. The spirit in me sees the spirit in you, and can love the spirit in you even though your human body has erred through hatred and fear. I see that you are a spiritual being on a painful path with many lessons to learn. And you, like me, are a child of Love, brother. Yes, I will call you brother. 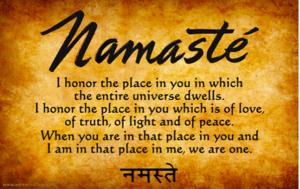 I will not let your hatred and terrorism, your fear and racism, make me afraid to travel in my spiritual awareness. If I did that, if I let your hatred close my portal to a higher plane where you are my brother, then your terrorism would have worked. So my heart is broken. My pain is excruciating. I will never ever forget. And the spirit in me continues to see the spirit in you. I forgive you. This sounds a lot like the definition of Namaste. No wonder that word is often used to mean “peace.” Thank you for your generous teaching, spiritual warriors in Charleston. May you find peace in and from your Soul. I send you Love.